My latest dinner at Le Calandre was one of my two best meals of 2017. Precise cooking, masterful technical ability, concentrated flavors, professional but not stuffy service and an outstanding wine list all combine for a memorable dining experience. Trying to decide which were my two best meals of the year turned out to be more difficult than usual in 2017, given the many worthy candidates for top spot. Atelier Crenn in San Francisco, Le Bernardin in NY, Carré des Feuillants in Paris, Ming Court in Hong Kong, and a few others all left lasting memories of great food, wines and friends. 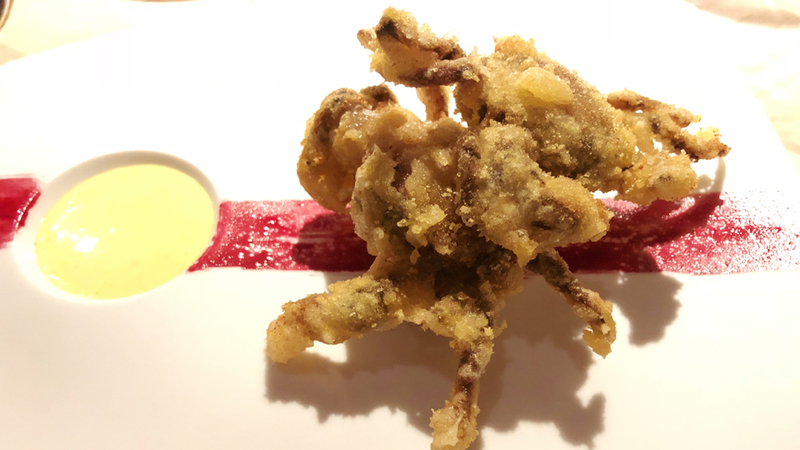 However, after picking a foreign restaurant as my winner last year (Auberge del L’Ill; reviewed here in 2016) this year I am back to picking an Italian restaurant, and two at that, ex–aqueo: Dal Pescatore (previously reviewed in 2017) and Le Calandre in Rubano, near Padua. Le Calandre, a modern looking (inside and outside) dining establishment, is part of the Alajmo empire that includes numerous dining spots in Rubano and surroundings including Quadri inVenice and Café Stern in Paris further afield. The flagship restaurant is situated in Rubano and is a favorite dining destination of foodies worldwide, with customers ranging from the famous (Donatella Versace was there the last time I dined) and the not so famous, but all of whom look forward to having a memorable meal. Le Calandre is run with considerable skill by brothers Massimiliano (chef) and Raffaele (maître). 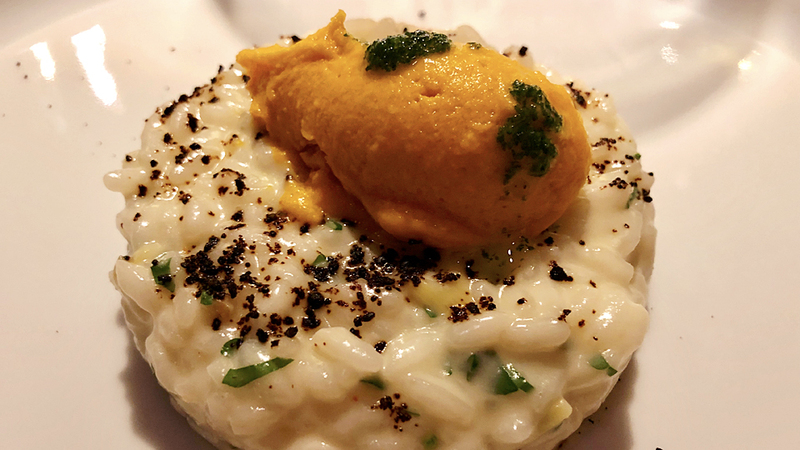 I first dined at Le Calandre in 2001 or 2002, and have found that over the years Massimiliano Alajmo’s cuisine has done nothing but improve. 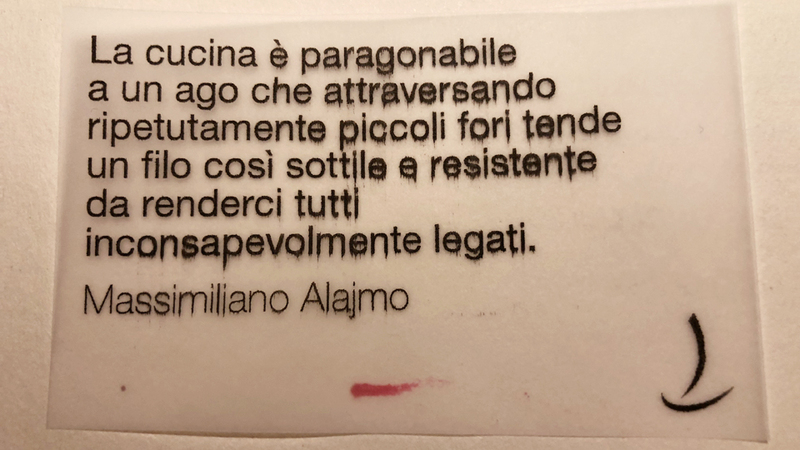 Although he was always the inventive sort, Alajmo has successfully managed to lighten up some of his creations so the meal ends with everyone having still considerable spring in his or her step. I do not remember it being always so in the past, but maybe it was just me and what I had eaten on previous visits. 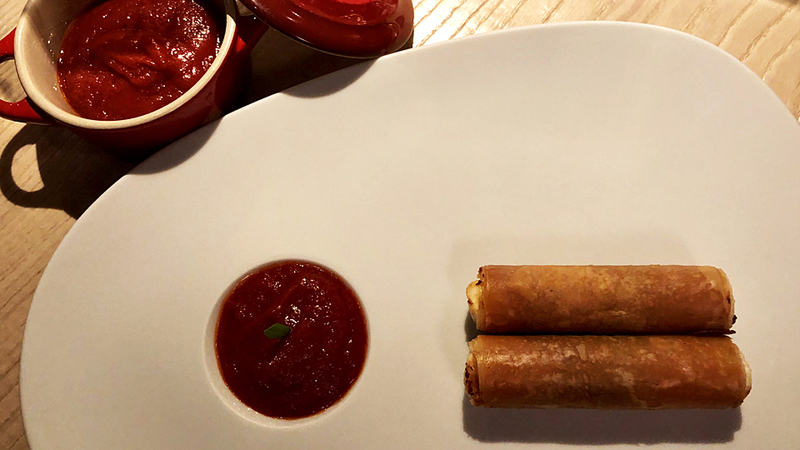 Over the years, Alajmo has created a number of dishes that have become famous and caused people to flock to Le Calandre just to try them, including the mozzarella and crispy buffalo ricotta cannelloni with tomato sauce as well as the saffron, juniper and licorice powder risotto. My personal favorites include the cuttlefish cappuccino (which I now regularly cook for my friends when I invite people over for dinner, though my rendition is nowhere near that of Alajmo’s) and the fried spaghetti and shrimp with a lettuce emulsion. 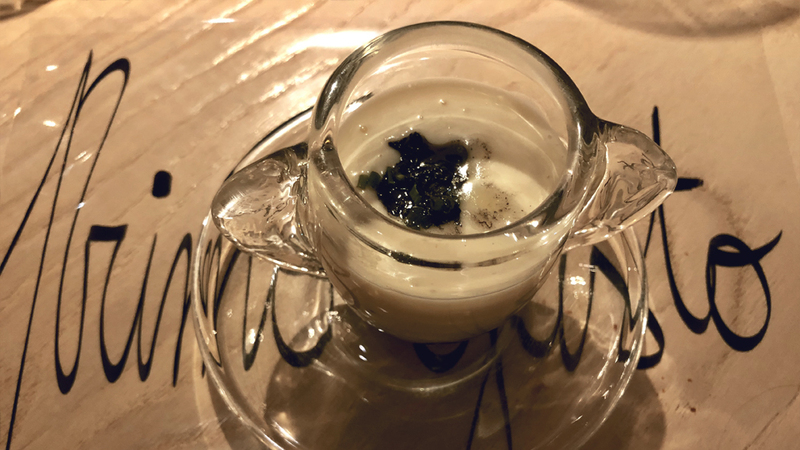 Many such historical dishes are available on the restaurant’s classic tasting menu, but there are also two other tasting menus to choose from. These are simply named after the brothers (hence the “Max” and the “Raf”) allowing you to catch a glimpse of the individual taste preferences of each brother. Importantly you do not need to stick to one menu alone, but can pick dishes from each menu and make up your own menu for the evening, which is what I do. My most recent meal at Le Calandre was one of the best I have ever had, and a truly virtuoso restaurant experience. Delightful, attentive service (friendly and professional and not at all stuffy), a quiet but not monastic environment, great food and wines: one really could not have asked for anything more. One dish after another sent me into culinary nirvana. 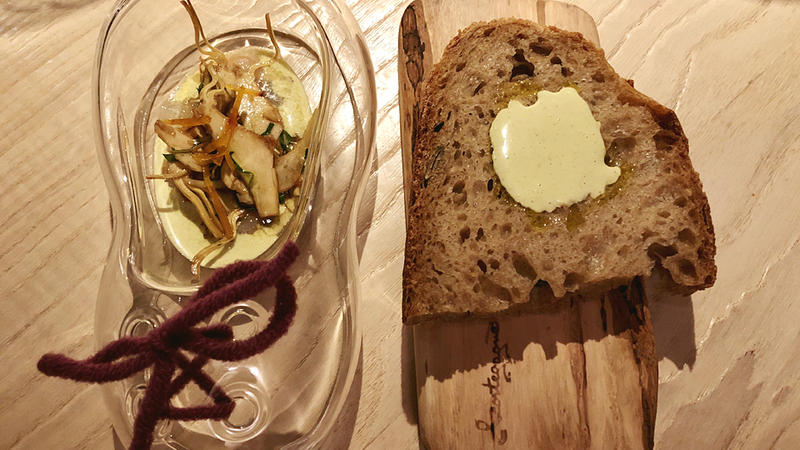 I want to point out that the simple dishes, such as the Triglie alla Luciana were just as good as the more inventive creations, a sure sign of someone who does not need to rely on bells and whistles to make an impression. The “alla Luciana” style preparations, typical of Campania and a reference to the town of Santa Lucia, usually involve small octopi, tomato, parsley, garlic and a little chili pepper. The ability to let the voice of simple ingredients such as herbs ring out loud and clear is a skill, but then, again I would expect no less from someone who trained with Marc Veyrat. The mostly young wines I chose to drink on this night were simply spectacular. I have rarely had a better night of drinking recent releases than this one. The 2016 Doro Princic Malvasia Collio was superb – a great aperitif in its mineral laser-like precision of white stone fruit and delicate herbs and easily one of the best Malvasia Istrianas I have had in years. But no surprise there, coming as Princic is a recognized master of the variety. 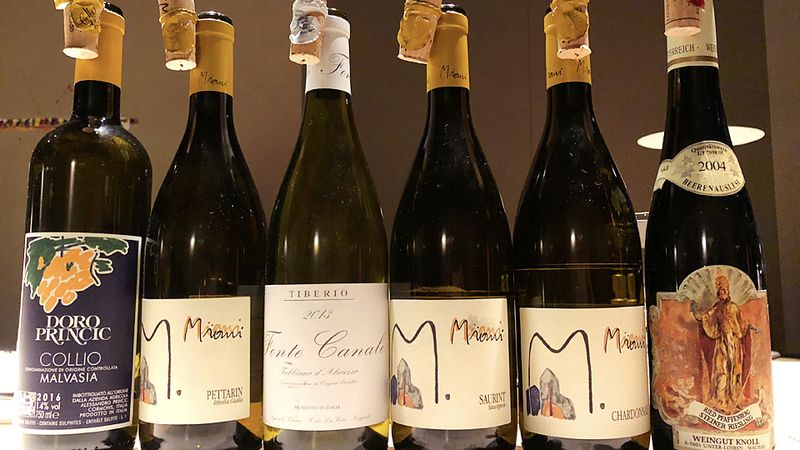 On this night, I had a chance to re-taste the latest and upcoming releases of some of Miani’s stellar whites. The 2016 Miani Ribolla Gialla Pettarin is another knockout Ribolla Gialla from Enzo Pontoni that reaches a level of concentration way beyond that of any other Ribolla made today. The pristine pomaceous orchard and citrus fruit and decadent mouthfeel are unforgettable. The 2016 strikes me as potentially one of the better young Ribolla Giallas Pontoni has made recently. Incidentally, I recently published a vertical of the Miani Ribolla Gialla. By contrast, the 2016 Miani Chardonnay is almost disappointing by the uniquely talented Enzo Pontoni’s standards. Don’t get me wrong, the Chardonnay is a delightful wine, but it lacks the usual depth and concentration that make Miani wines so compelling. Furthermore, there are just too many other outstanding Chardonnays from elsewhere in the world (certainly not Italy) that people can drink instead, which is not the case with this producer’s other truly remarkable wines. The 2013 Tiberio Trebbiano d’Abruzzo Fonte Canale is a work of art. I had rated it 94 on release but it’s better than that today, and a dead ringer for a great Chablis from Les Clos or Blanchots, depending on the vintage. It is truly amazing just how old vines (more than sixty years old in this case), terroir and winemaking talent combine to give what is one of Italy’s dozen or so best white wines. I finished my meal off with the delicious 2004 Emmerich Knoll Riesling Ried Pfaffenberg Steiner Beerenauslese Wachau, which is an exercise in impeccable balance and suave but soft, open-knit Riesling aromas and flavors. I never cease to be amazed at just how well Knoll’s Riesling translates Pfaffenberg’s slightly warmer microclimate and different soil in the glass. Located in the Austrian wine region of the Kremstal literally just a stone’s throw away from the more famous Wachau, the Pfaffenberg’s wines are very different from those of the Wachau, such as those of the Loibenberg for example. The Pfaffenberg sits on a mix of granite, schist and gneiss, with a layer of loess on the surface, while the Loibenberg vineyard, in the Wachau, and also farmed by Knoll, has a mostly gneiss soil and gives less fruity but more spicy, structured wines. Independently of the geology lesson each one of Knoll’s wines delivers, this 2004 is an absolute beauty that is drinking perfectly well right now. It is not so common to find Knoll Beerenauselesen wines, so I never pass on the opportunity to drink one when the opportunity arises. All things considered, I walked out of Le Calandre thinking that not just the meal had been one of the two best of 2017, but the wine selection was right up there too. Evenings such as this one at Le Calandre is what dining memories are made of.